There have been few times in my life that a moment in time was so surreal, so incredibly perfect, that I actually questioned whether or not it could be happening to me. This was one of those moments. Venice. Our legs dangled off the edge of a narrow street toward the water. We sat side by side, watching as fireworks filled the night sky. Hundreds of small boats adorned the canal, each lit with string lights and lanterns, the sound of joyful voices cascading from their decks. I grasped his hand with both of mine as we sat in silence, awe-struck by the incredible celebration of life before our eyes. Several times, I opened my mouth to speak... but I just couldn't get the words out. We'd been in Italy for several days and I had been waiting for the perfect moment. My cheeks were hot and my hands shook so uncontrollably I felt like they weren't my own. Finally, with fireworks booming overhead, I leaned over and whispered into his ear... "It's almost as if they are congratulating us." The glow from the lanterns above revealed a confused expression as he looked at me. "Congratulating us?" I responded through the tears of joy I'd been holding back for days. "On becoming parents!" We spent the evening walking up and down the picture perfect streets, dreaming about the baby we loved so dearly already. I was overwhelmed. Just overwhelmed. With joy, with gratitude that we'd conceived, that an early spring due date would be perfect timing for me to take a maternity leave from teaching, that we were beginning this much awaited journey together and celebrating it in the most beautiful and romantic city in the world. We were on an indescribable high. Sometimes I wonder... if that moment had been less perfect, less surreal, less like a beautiful dream... would the low that followed have felt like the nightmare that it was? Would we have crashed down just as hard and as far? Although I ask myself these ridiculous questions, I know the answer is yes. Because when you experience pregnancy loss, no matter the circumstances, it is completely and utterly devastating. Eight weeks of uncertainty and fear. From start to finish, that is how long my miscarriage lasted. I miscarried, learned I was somehow still pregnant, then had another miscarriage. The most likely explanation given to us was that I conceived twins and miscarried them one after the next. The months that followed were... hard. I remember sitting (hiding, more appropriately) in the shower once, twice, sometimes three times a day with my face pressed into my knees, numb to the ever flowing tears. I felt so empty. So guilty. My mind was constantly filled with questions. Did I do something wrong? Did I eat something bad? Did I push myself too hard hiking in Cinque Terre? Did I lay in the sun too long on the Italian coast? Was it because I drank that glass of wine at our friend's wedding before I knew I was pregnant? Was something wrong with me? Would I ever have children? Would my husband regret marrying me if I couldn't? Those questions were painful, and they would echo in my mind for months. But they weren't even the hard questions. I'm ashamed of the hard questions that haunted me during that time. The ones where I challenged the God who gave me salvation. The ones where I questioned His motives, His love, His plan for my life, and even His very existence. There were so many times that I thought I was out of the thick of it. Then without warning, the hollowness would return. Toward the beginning, Mitchell would find me crying and immediately ask, "Are you okay? What's going on?" I couldn't tell him, because there weren't words. Eventually, when tears streamed down my face as I washed dishes, when he found me weeping at the foot of the bed, when I laid on the couch and buried my face into the dog, he didn't ask anymore. He just held me where I was, told me he loved me and prayed over me. It was his unwavering, delicate love and care for me, and his steadfast faith in the Lord, that saved me from myself during this emotional and spiritual crisis. It's hard to verbalize, but I wouldn't change this dreadful time in our lives. Not for anything. Mitchell and I grew closer together in the most remarkable sense because of it. We now spend our days endlessly loving a baby boy who wouldn't exist if I had never miscarried. And by the grace of God, I have been able to connect and journey with other women experiencing the same heartache that I endured. 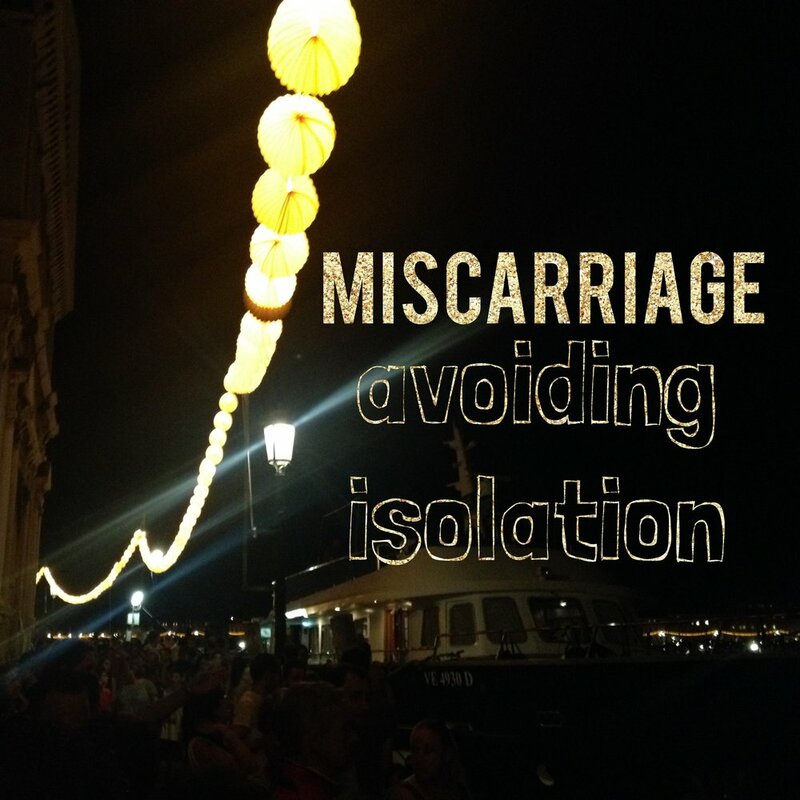 It took me a long time to be able to talk about my miscarriages. But when I did, I felt a weight lifted from my heart. When I shared with my coworkers, I no longer felt like I was wearing a mask in the staff room every day, pretending my heart was whole. When I told my family and friends, I learned that several of them had also experienced pregnancy loss in the past, and while I was heartbroken for them, it somehow made me feel human again. Pregnancy loss is hard. It is extremely isolating. Isolation can be self-destructive and Lord knows that as women, we are self-destructive enough without boxing ourselves and our emotions up and hiding them away. If you are going through your own pregnancy loss journey, I encourage you to reach out to someone. I know, it's hard. I remember feeling like if I didn't say it to anyone, it would somehow be less real. It is real, but it's going to get better. The first time you share will be the hardest. But it will get easier. And although you will never forget, you will heal and move forward. If you're not sure who to reach out to, consider reaching out to me. Whether I know you now or not, I promise to love you and to pray for you through your journey.